Look inside almost any classroom today and you'll see a mirror of our country. You'll find students from multiple cultures, some of whom are trying to bridge the languages and behaviors of two worlds. Students with very advanced learning skills sit next to students who struggle mightily with one or more school subjects. Children with vast reservoirs of background experience share space with peers whose world is circumscribed by the few blocks of their neighborhood. All these students have the right to expect enthusiastic teachers who are ready to meet the students as they are, and to move them along the pathway of learning as far as fast as possible. The reality, however, is that many of these students will encounter a teacher who is enmeshed in a system geared up to treat all 1st graders as though they were essentially the same, or all Algebra I students as though they were alike. Classrooms and schools are rarely organized to respond well to variations in student readiness, interest, or learning profile (Archambault et al., 1993; Bateman, 1993; International Institute for Advocacy for School Children, 1993; McIntosh, Vaughn, Schumm, Haager, & Lee, 1993; Tomlinson, 1995; Tomlinson, Moon, & Callahan, 1998; Westberg, Archambault, Dobyns, & a and b; Salvin, 1993). Most educators appear even to lack images of how a classroom might look—how we would “do school”—if our intent was to respond to individual learner needs. In fact, the challenge of addressing academic diversity in today's complex classrooms is as important and difficult a challenge as we have before us. We've learned a great deal recently about how applying “differentiated instruction” can help address the needs of academically diverse learners in our increasingly diverse classrooms (see Chapter 2 for a discussion of the theory and research that supports differentiation as a way of thinking about teaching and learning). Many teachers have begun to use, or expanded their use of, the principles and practices of differentiation. To make these practices more widespread—to move from differentiation in individual classrooms to differentiation that is pervasive throughout schools and school districts—requires strong and skilled leadership. As logical as such personalized classrooms seem, making them a reality challenges many comfortable assumptions and practices related to teaching and learning. For instance, planning for more personalized classrooms prompts an array of questions: Do our current practices make learners more independent or more dependent? What is the purpose of “standard” report cards, and are they effective? Does learning happen in someone or to them? How can we be “fair” and still respond to learner variance? How do standards and standardization differ? We might be tempted to just cast aside, or try to forget, these sorts of professional goblins; changing practices in response to prickly insights can be troublesome. Until we face these questions, though, most students inside the classroom door will be ill served. Without large numbers of classrooms where teachers are skilled in meeting varied learners where they are and moving them ahead briskly and with understanding, the number of frustrated and disenfranchised learners in our schools can only multiply. The purpose of this chapter is not to present an exhaustive discussion of differentiated instruction. (See the list at the end of the chapter for resources on this topic.) Rather, the chapter first reviews key vocabulary and principles of effective differentiation. The chapter then addresses some fundamental questions about differentiation that are important for people who want to establish a greater number of responsive or differentiated classrooms in their districts or schools. Teachers can create differentiated, personalized, or responsive classrooms in a number of ways. Figure 1.1 presents a concept map for thinking about and planning for effectively differentiated classrooms. In the context of education, we define differentiation as a teacher's reacting responsively to a learner's needs. A teacher who is differentiating understands a student's needs to express humor, or work with a group, or have additional teaching on a particular skill, or delve more deeply into a particular topic, or have guided help with a reading passage—and the teacher responds actively and positively to that need. Differentiation is simply attending to the learning needs of a particular student or small group of students rather than the more typical pattern of teaching the class as though all individuals in it were basically alike. The goal of a differentiated classroom is maximum student growth and individual success. As schools now exist, our goal is often to bring everyone to “grade level” or to ensure that everyone masters a prescribed set of skills in a specified length of time. We then measure everyone's progress only against a predetermined standard. Such a goal is sometimes appropriate, and understanding where a child's learning is relative to a benchmark can be useful. However, when an entire class moves forward to study new skills and concepts without any individual adjustments in time or support, some students are doomed to fail. Similarly, classrooms typically contain some students who can demonstrate mastery of grade-level skills and material to be understood before the school year begins—or who could do so in a fraction of the time we would spend “teaching” them. These learners often receive an A, but that mark is more an acknowledgment of their advanced starting point relative to grade-level expectations than a reflection of serious personal growth. In a differentiated classroom, the teacher uses grade-level benchmarks as one tool for charting a child's learning path. However, the teacher also carefully charts individual growth. Personal success is measured, at least in part, on individual growth from the learner's starting point—whatever that might be. Put another way, success and personal growth are positively correlated. The remainder of Figure 1.1 expands on our definition of differentiation, providing a handy framework for thinking about, planning for, and evaluating the success of differentiation. A differentiated classroom is flexible. Demonstrating clarity about learning goals, both teachers and students understand that time, materials, modes of teaching, ways of grouping students, ways of expressing learning, ways of assessing learning, and other classroom elements are tools that can be used in a variety of ways to promote individual and whole-class success. Differentiation of instruction stems from effective and ongoing assessment of learner needs. In a differentiated classroom, student differences are expected, appreciated, and studied as a basis for instructional planning. This principle also reminds us of the tight bond that should exist between assessment and instruction. As teachers, we know what to do next when we recognize where students are in relation to our teaching and learning goals. We are also primed to teach most effectively if we are aware of our students' learning needs and interests. In a differentiated classroom, a teacher sees everything a student says or creates as useful information both in understanding that particular learner and in crafting instruction to be effective for that learner. Flexible grouping helps ensure student access to a wide variety of learning opportunities and working arrangements. In a flexibly grouped classroom, a teacher plans student working arrangements that vary widely and purposefully over a relatively short period of time. Such classrooms utilize whole-class, small-group, and individual explorations. Sometimes students work in similar readiness groups with peers who manifest similar academic needs at a given time. At other points, the teacher ensures that students of mixed readiness work together in settings that draw upon the strengths of each student. Sometimes students work with classmates who have like interests. In other situations, students of varied interests cooperate toward completing a task that calls on all the interests. Students might work with those who have similar learning patterns (for example, a group of auditory learners listening to a taped explanation), and some tasks call for a grouping of students with varied learning patterns (for example, a student who learns best analytically with one who learns best through practical application). Sometimes working arrangements are simply random; students work with whoever is sitting beside them, or they count off into groups, or they draw a partner's name. Finally, in a flexibly grouped classroom, students themselves sometimes decide on their work groups and arrangements, and sometimes teachers make the call. Figure 1.2 shows the possible grouping combinations that can be achieved by mixing all the options between “levels” of the three-tiered diagram. Flexible grouping used consistently and purposefully has a variety of benefits: opportunity for carefully targeted teaching and learning, access to all materials and individuals in the classroom, a chance for students to see themselves in a variety of contexts, and rich assessment data for the teacher who “auditions” each learner in a wide range of contexts. All students consistently work with “respectful” activities and learning arrangements. This important principle provides that every learner must have tasks that are equally interesting and equally engaging, and which provide equal access to essential understanding and skills. In differentiated classrooms, a teacher's goal is that each child feels challenged most of the time; each child finds his or her work appealing most of the time; and each child grapples squarely with the information, principles, and skills which give that learner power to understand, apply, and move on to the next learning stage, most of the time, in the discipline being studied. Differentiation does not presume different tasks for each learner, but rather just enough flexibility in task complexity, working arrangements, and modes of learning expression that varied students find learning a good fit much of the time. Students and teachers are collaborators in learning. While the teacher is clearly a professional who diagnoses and prescribes for learning needs, facilitates learning, and crafts effective curriculum, students in differentiated classrooms are critical partners in classroom success. Students hold pivotal information about what works and does not work for them at any given moment of the teaching-learning cycle, they know their likes and preferred ways of learning, they can contribute greatly to plans for a smoothly functioning classroom, and they can learn to make choices that enhance both their learning and their status as a learner. In differentiated classrooms, teachers study their students and continually involve them in decision-making about the classroom. As a result, students become more independent as learners. Using math manipulatives with some, but not all, learners to help students understand a new idea. Using texts or novels at more than one reading level. Presenting information through both whole-to-part and part-to-whole approaches. Using a variety of reading-buddy arrangements to support and challenge students working with text materials. Reteaching students who need another demonstration, or exempting students who already demonstrate mastery from reading a chapter or from sitting through a reteaching session. Using texts, computer programs, tape recorders, and videos as a way of conveying key concepts to varied learners. Process. A teacher can differentiate process. Process is how the learner comes to make sense of, understand, and “own” the key facts, concepts, generalizations, and skills of the subject. A familiar synonym for process is activity. An effective activity or task generally involves students in using an es- sential skill to come to understand an essential idea, and is clearly focused on a learning goal. A teacher can differentiate an activity or process by, for example, providing varied options at differing levels of difficulty or based on differing student interests. He can offer different amounts of teacher and student support for a task. A teacher can give students choices about how they express what they learn during a research exercise—providing options, for example, of creating a political cartoon, writing a letter to the editor, or making a diagram as a way of expressing what they understand about relations between the British and colonists at the onset of the American Revolution. Allow students to help design products around essential learning goals. Encourage students to express what they have learned in varied ways. Allow for varied working arrangements (for example, working alone or as part of a team to complete the product). Provide or encourage use of varied types of resources in preparing products. Provide product assignments at varying degrees of difficulty to match student readiness. Use a wide variety of kinds of assessments. Work with students to develop rubrics of quality that allow for demonstration of both whole-class and individual goals. Students vary in at least three ways that make modifying instruction a wise strategy for teachers: Students differ (1) in their readiness to work with a particular idea or skill at a given time, (2) in pursuits or topics that they find interesting, and (3) in learning profiles that may be shaped by gender, culture, learning style, or intelligence preference. Adjusting the degree of difficulty of a task to provide an appropriate level of challenge. Adding or removing teacher or peer coaching, use of manipulatives, or presence or absence of models for a task. Teacher and peer coaching are known as scaffolding because they provide a framework or a structure that supports student thought and work. Making the task more or less familiar based on the proficiency of the learner's experiences or skills for the task. Varying direct instruction by small-group need. Interest. To differentiate in response to student interest, a teacher aligns key skills and material for understanding from a curriculum segment with topics or pursuits that intrigue students. For example, a student can learn much about a culture or time period by carefully analyzing its music. A social studies teacher may encourage one student to begin exploring the history, beliefs, and customs of medieval Europe by examining the music of the time. A study of science in the Middle Ages might engage another student more. Using adults or peers with prior knowledge to serve as mentors in an area of shared interest. Providing a variety of avenues for student exploration of a topic or expression of learning. Providing broad access to a wide range of materials and technologies. Giving students a choice of tasks and products, including student-designed options. Encouraging investigation or application of key concepts and principles in student interest areas. Creating a learning environment with flexible spaces and learning options. Presenting information through auditory, visual, and kinesthetic modes. Encouraging students to explore information and ideas through auditory, visual, and kinesthetic modes. Allowing students to work alone or with peers. Ensuring a choice of competitive, cooperative, and independent learning experiences. Balancing varied perspectives on an issue or topic. Providing authentic learning opportunities in various intelligence or talent areas. As you can see, differentiation of content, process, and products is achievable in each of the areas of student readiness, interest, and learning profile. Instructional strategies are tools of the teacher's art. Like all tools, they can be used artfully or clumsily, appropriately or inappropriately. The person who uses them determines their worth. No instructional strategy can compensate for a teacher who lacks proficiency in his content area, is unclear about learning goals, plans an unfocused activity, or does not possess the leadership and management skills to orchestrate effective classroom functioning. Nonetheless, a teacher who is comfortable and skilled with the use of multiple instructional strategies is more likely to reach out effectively to varied students than is the teacher who uses a single approach to teaching and learning. Teachers are particularly limited when the sole or primary instructional strategy is teacher-centered (such as lecture), or drill-and-practice (such as worksheets). By sharing a common vocabulary and beginning with a common set of principles related to differentiation, school leaders have more tools to provide guidance and direction for all staff members as they begin the journey toward developing more academically responsive classrooms. Attending to learner variance and need historically has made common sense in a classroom. This approach also reflects decades of proliferating knowledge about the brain, learning styles and varieties of intelligence, the influence of gender and culture on how we learn, human motivation, and how individuals construct meaning. Teachers and school leaders who spend time in a classroom see the significant array of learner differences. People who study the scholarship of this field understand differences and the need to attend to them, if we are to serve properly the children and families who trust us. All evidence aside, however, moving away from the sense that we ought to personalize our classrooms to doing something substantial about it is devilishly difficult. Setting out to develop a significant number of responsive, personalized, or differentiated classrooms in our schools is an educational change of monumental proportions. Therefore, the purpose of this book is to explore how school leaders can encourage and support such significant changes in our classrooms. Beyond the general framework and principles of differentiated instruction are at least three additional considerations for educators who desire to provide leadership in differentiation. These interrelated considerations provide a compass for our journey. First, differentiation that is rooted in ineffective classroom practice cannot succeed. Trivial and fluffy curriculum remains trivial and fluffy even after differentiation. Varied versions of an ill-focused product are no more helpful. A pernicious classroom environment cannot invite learners to be comfortable with themselves and one another. A teacher who does not see assessment as a continual window into the needs of her students has little sound footing from which to differentiate instruction. A teacher who cannot learn to trust and share responsibility with her students would, at best, have students seated in rows and completing varied worksheets silently and alone. Perhaps the most singular truth about providing leadership for differentiated classrooms is that you should often feel as though you are moving backwards rather than forwards! You need to spend time reflecting on and providing leadership in the fundamentals of effective teaching when or before you provide leadership in the more sophisticated skills of differentiation. Second, differentiation is more than a strategy or series of strategies—it is a way of thinking about teaching and learning. In other words, facilitating teacher growth in differentiation is not so much about introducing tiered lessons, independent study, alternative forms of assessment—or even moving to multitext adoption. Practicing quality differentiation is much more about knowing what matters to teach, realizing that learning happens in us rather than to us, continually reflecting on the “particularness” of each of our students, and pondering how to develop both the commonalities students share as humans and the singularities students bring as individuals. If we as teachers understood the nature of our art more fully and deeply, more differentiation would likely evolve from that understanding. Learning some new “tricks” with little sense of why they matter is less helpful. Third, movement toward differentiation in teaching is movement toward expertise. Regarding differentiation, teachers can say, “I already do that.” Most teachers at some times and in some ways obviously adapt or adjust for students' learning needs. The truly expert teacher understands, however, that even after a dozen careers in the classroom, he could still learn more about his subject and his learners and how to link each learner and subject with power and joy. In truth, providing effective leadership for differentiation fosters the sort of continual growth teachers need throughout their classroom lives in order to help each learner build the best life possible. Effective leadership for differentiation comes from dogged, unremitting insistence on and support for the fact that expert teachers teach students the most important things in the most effective ways. The mission of effective leadership is to maximize the number of expert teachers in a school's or district's classrooms. 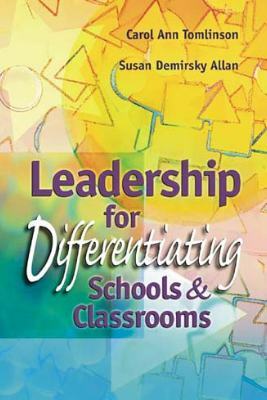 One goal of this book is to provide very practical guidance in how to be an effective leader in establishing more differentiated classrooms and more effectively differentiated classrooms. Remember, however, that practicality is necessarily rooted in understanding and vision. With this vocabulary and these beliefs in mind, we have developed this book to help educational leaders think through the complexities of guiding substantial change in classrooms at the school and district levels. In Chapter 2, the book examines potential positive outcomes of differentiation based on theory, research, and less formal observation. Chapter 3 provides an overview of what literature on school change reveals about practices that impede and facilitate change in schools and districts. Chapter 4 looks at key conditions at the initiation of school or district movement toward differentiation. Chapter 5 examines practical strategies useful in the implementation stages of growth toward differentiation, while Chapter 6 spotlights the imperative of effective staff development programs to undergird differentiation efforts. Chapter 7 discusses key considerations in the continuation stage of change, as differentiation becomes more common in a school or district. Chapter 8 takes a look at communicating with parents and the public about differentiation. Chapter 9 details a case study of a district involved in a serious and focused change effort for differentiated classrooms, allowing a look—in context—at many of the principles and practices discussed elsewhere in the book. The last chapter in the book presents a final challenge for educational leaders as they provide guidance and support for developing a growing number of classrooms capable of addressing the academic diversity that typifies today's schools and will typify schools in the years ahead. We hope you enjoy thinking along with us! Note: See also References at the end of this book, as well as additional resources in several chapters. Bearne, E. (Ed.). (1996). Differentiation and diversity in the primary school. New York: Routledge. Buswell, B., Schaffner, C., & Seyler, A. (1999). Opening doors: Connecting students to curriculum, classmates, and learning. Colorado Springs: PEAK Parent Center, Inc.
Kiernan, L. (Producer). (1997). Differentiating instruction [A video staff development set]. Alexandria, VA: Association for Supervision and Curriculum Development. Madea, B. (1994). The multiage classroom: An inside look at one community of learners. Cypress, CA: Creative Teaching Press. Tomlinson, C. (1995). How to differentiate instruction in mixed ability classrooms. Alexandria, VA: Association for Supervision and Curriculum Development. Tomlinson, C. (1996). Differentiating instruction for mixed-ability classrooms [A professional inquiry kit]. Alexandria, VA: Association for Supervision and Curriculum Development. Tomlinson, C. (1999). The differentiated classroom: Responding to the needs of all learners. Alexandria, VA: Association for Supervision and Curriculum Development. Winebrenner, S. (1992). Teaching gifted kids in the regular classroom. Minneapolis, MN: Free Spirit Publishing. Winebrenner, S. (1996). Teaching kids with learning difficulties in the regular classroom. Minneapolis, MN: Free Spirit Publishing. Copyright © 2000 by Association for Supervision and Curriculum Development (ASCD). All rights reserved. No part of this publication—including the drawings, graphs, illustrations, or chapters, except for brief quotations in critical reviews or articles—may be reproduced or transmitted in any form or by any means, electronic or mechanical, including photocopy, recording, or any information storage and retrieval system, without permission from ASCD.